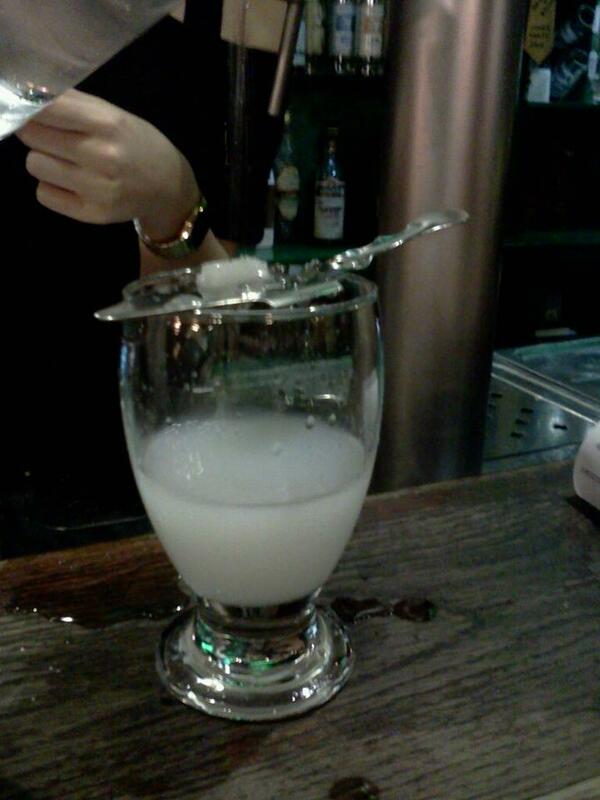 Absinthe? Oh yeah. I briefly texted a friend while waiting for the eight PM opening time (apparently it's best to be smashed after dark), but she declined. No worries, my bilingual, bisexual, bipedal bar maiden kept me company while instructing me the finer pleasures of the French method of drinking absinthe. Apparently there are three, but we both agreed the French who set the higher standard in most cases, should be the methodology we'd employee for our experimentation and my curiosity. Dripping water over a sugar cube on a slotted spoon, eventually you have a sweetened licorice drink with the same alcohol levels used in funny car racing (Formula-One for you European types). Technically they call absinthe a "spirit", and you're in good company when you drink it. Everyone from Hemingway to Oscar Wilde has consumed the Green Fairy as it's known.